Combined Insurance employees volunteer at the Hines Fisher House. CHICAGO, July 27, 2018 /PRNewswire/ -- Combined Insurance employees participated in a volunteer activity at the Fisher House in Hines, Ill., for the second year. The company has supported the foundation through sizeable corporate donations in the past to Fisher Houses in Texas and Florida as part of their military-focused charitable giving program. 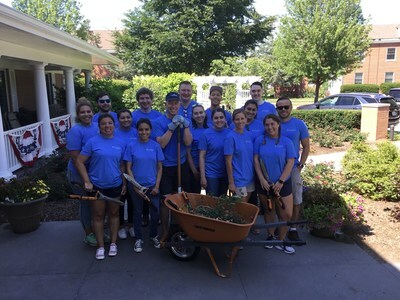 A team of 16 employees performed gardening duties and helped clean and beautify the grounds, which serve as a 'home away from home' for family members, caregiver or loved ones of patients who are receiving medical care at the Edward Hines Jr. VA Hospital. "Combined Insurance actively seeks out opportunities to help the military community and its veterans," said Bob Wiedower, Vice President of Sales Development and Military Programs at Combined Insurance. "After spending 22 years as a Marine Corps Officer, I recognize the value and importance of the Hines Fisher House, an organization that helps military families every year by providing a place where they can feel safe and welcome during difficult times. I am honored to volunteer my time to such an outstanding organization." "We are very fortunate that the community has embraced our home, and continually donate both money and time to help with its upkeep. But, in order to provide the level of service that we need to for our military families, it is important that organizations like Combined Insurance continue to step up and contribute, whether it's through volunteering their time, financial donations or in-kind support. We want the Fisher House to be a 'home away from home' for our guests, and having a beautiful landscape and garden is a big part of that," says Holly Wright, Manager, Hines Fisher House. Combined Insurance, a Chubb company, has received numerous accolades throughout the years for its veteran-friendly corporate practices. The company was named a Top 5 Military Friendly® Employer in 2018 by G.I. Jobs—marking the seventh consecutive year that Combined Insurance has made the Top 10 employer list and fourth consecutive year in the Top 5. And, this year, was named a 'Best for Vets' employer by Military Times. In addition to providing meaningful employment, Combined Insurance also gives back to military and veteran-focused charities through employee volunteerism and corporate donations. The company has given back and provided support to numerous military and veteran-focused organizations, such as Luke's Wings, USO of Illinois and Heartland Alliance – Support Services for Veteran Families (SSVF).